The 1st of December marked our annual Christmas Bookshop meeting at Brown’s Books. Our little Sherlockian tree, all trimmed with ornaments representing various cases from the Canon stood proudly amid delicious treats. Many thanks the Roger Brown for leaving the door to his bookshop open for the flock of Petrels this chilly December night. 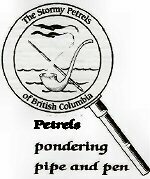 The first gathering of Petrels in the new year will be in celebration of the birthday of the world’s first consulting detective. The Sherlock Holmes Birthday luncheon will take place at “The White Spot” located at the corner of West Georgia & Cardero at 11:15 on January 9, 2010. This is an informal event, but we may have a guest speaker at this time. Mr. Eric Swanick of “special collections” at Simon Fraser University may be on hand to tell us about the collection and our part in it. Please join us if you want to learn more. The next regular meeting will take place in February. Details will follow at a later date.